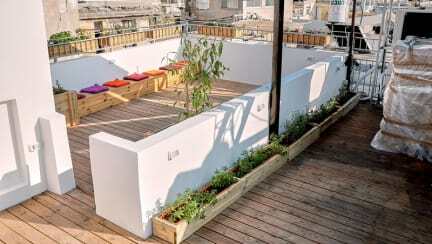 Pepo Hostel, Tel Aviv, Izrael : Rezerwuj teraz! Pepo Hostel is a small family boutique Hostel. Located in the famous picturesque 'Yemenites' Vineyard' neighborhood, adjacent to the Carmel Market and just a 2-minute walk away from the Tel Aviv beach line. 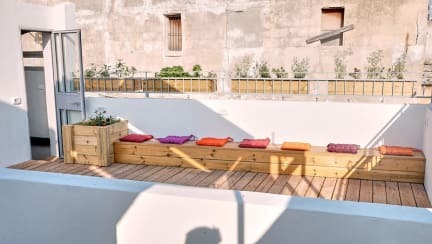 Among many hotels and short term apartments, it is the first and only hostel located in-between the streets of this beautiful, unique, old neighborhood. The Hostel itself is a top floor and a rooftop of an old authentic Yemenite building, which was built by Yemenite pioneers out of a sea stone called 'Zifzif', before the establishment of the State. It was preserved and redecorated with taste using wood, paint and metal art pieces, and provides a homelike atmosphere to its beloved guests. Our three mixed dorms are simply decorated and can host up to 8 guests each. They include baggage size lockers, USB outlets and a shelf for each bed. Each dorm has an en-suite bathroom and the hostel boasts a spacious balcony in which you can chill-out. Payment upon arrival by cash, credit card or debit card. Check in from 15:00 to 00:00.